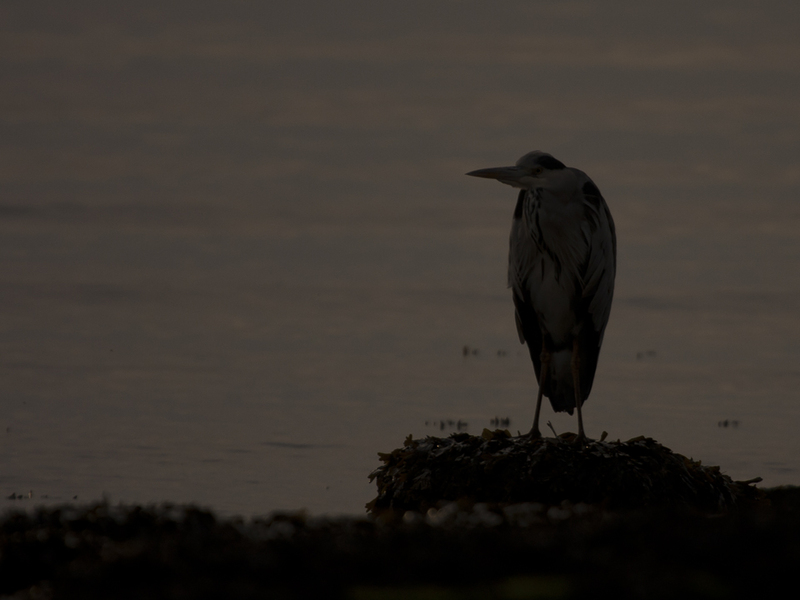 Another day is drawing peacefully to a close on the Patch. All along the muddy banks of the Dee (and beyond) the working day is ending, in offices computers are being logged off, on high streets shop-front roller shutters are clattering closed and everywhere thoughts are turning towards evening meals/tonight’s TV. For a change the weather has been kind to us today. True, it has been chilly, but the wind is breathless and the rain has held off leaving a cold, clear, calm day. 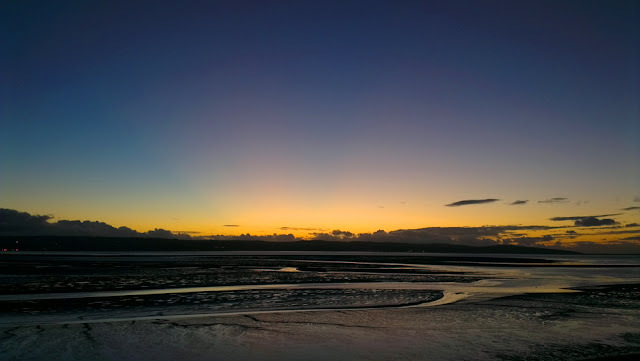 Looking out across the estuary from the top of the cliffs at Thurstaston the sun, dazzling but lacking in real warmth, is following its unstoppable downward parabola towards the Welsh hills. The sky is coloured lemon yellow at the horizon and dims to a beautiful inky indigo above my be-hatted head. Crowning the hills is a mantle of cloud, a warning of the precipitation forecast for us tomorrow, but for now the air remains still. The mudflats are also motionless; they appear black but are veined with channels of water reflecting the tranquil firmament above. Sunsets on the Dee can be spectacular and a great way of rounding off a day on the Patch, but few birders would regard this as a good time to contemplate a birdwatching trip to the shore, but that is exactly what I am planning. The tide will reach its full height in a couple of hours and for those next 120 minutes the birds that are working the flats will put on a spectacular show. OK, so I won’t be able to see much of it, but the sound will make up for the lack of visuals. But before I begin the two-and-a-bit mile walk home I am sitting atop the cliffs letting my eyes become accustomed to the gloom. 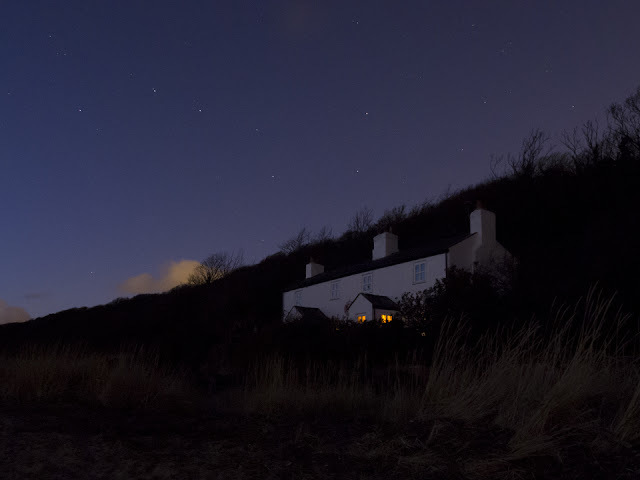 It always surprises me how well we can see in the dark and how we have become very disconnected with the night. It is presented as a time to be avoided and as such we have filled it with tales of ghosts and monsters, making it something to be frightened of. The reality feels quite different to me, the darkness is not something I fear, it just offers another slant on the Patch and its wildlife, a chance to experience things from a different perspective. 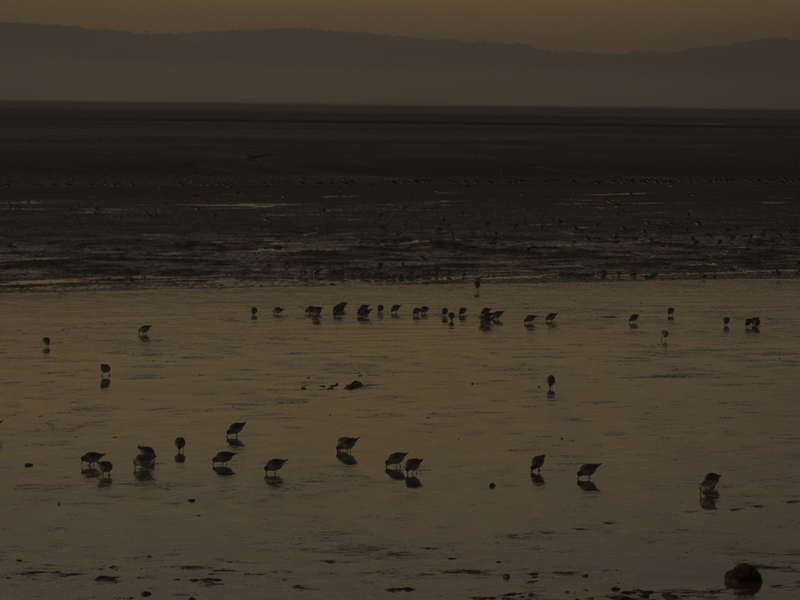 The dark doesn’t stop the hustle and bustle of the birds on the shore either, high and low tide rule their lives. When low the birds are feeding, once risen and their food submerged they roost until the water recedes and feeding can re-commence. It is the period of inundation that is great to observe by day or by night. Each of the species present have different tidal habits. The Oystercatchers huddle together and then march together diagonally across the mud towards the far fringes of the marsh. The Curlews that feed singly at low water gather in a loose flock between the Oycs and the gutter close to the shore. Redshank fly in noisy squadrons over this channel to populate the muddy trenches previous tides have engraved into the marsh. The Shelduck and Pintail simply wait for the tide to lift them from their slumber and carry them marshward, they are easily the most relaxed birds here. The Knot and the Dunlin try to resist the waters rise as if protesting at the forced end to their feeding. Of course the tide will not yield and they are herded along the flats like a kettled crowd at a demonstration. 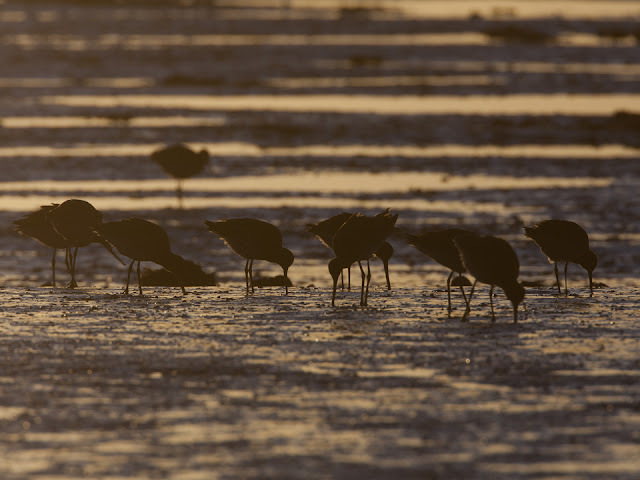 The Black-tailed Godwits that feed in thick flocks are unravelled by the incoming tide and soon form a single line at the waters edge, advancing with the tide towards the marsh. Of course I’m not going to see much of this happen tonight, but I’ll be able to hear it happen, the rest will be filled in by my mind’s eye from the observations I have made in the daylight and this will be an equally rewarding experience. As the creeks and gullies fill with water birds are flushed on to the open stretches of mud that stand like freshly laid wet cement, the glassy surface reflecting what little light is left, and I can make out tiny bird shaped silhouettes zipping across the mud from puddle to puddle. I am familiar with their toddling gait– they are Knot making the most of the last feeding opportunity before high tide. I can discern little else, save for some Black-tailed Godwits further out. 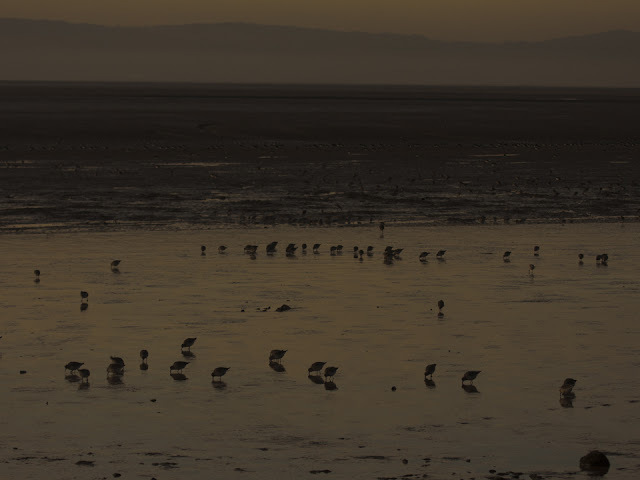 Their silhouette is distinctive against the mud that glows with the last of the sunset orange. To my left, along the beach towards Caldy I can make out the hunched figure of a Grey Heron. It lingers on the leading edge of the incoming tide for a few minutes before disappearing into the dark. The gloom is rising and detail is fading, but I can hear plenty. Noisiest, as usual, are the Oystercatchers, their loud piercing calls are clear; the long march to the marsh sounds anything but orderly. The frequency and pitch of these cries increases as disputes break out in the ranks. In the midst of the Oycs I hear another call. It sounds like Popeye chuckling, that’s the only way I can describe it. This 'laughter' comes from a Shelduck. Next I hear one of the most evocative and well known calls of any bird on the estuary as a Curlew lets go its bubbling whistle. Almost immediately another replies, then another. I wonder what (if any) message is contained within those sounds. The sound subsides almost as quickly as it arose, I assume the birds have taken off and flown to roost. A constant background to this is the metallic chatter of the (presumably still feeding) Blackwits. The tide if beginning to rush in now and soon the flats will be covered and the audio show will be over. Lots of birds must be moving now. I can hear lots of the “cheeeeeew” calls of flying Redshanks and the occasional “preeeeep” of a following Dunlin. My favourite sound has to be the soft hoots that the Pintails are exchanging. They loaf about in the cover of the deepest part of the channel for the majority of the day and largely stay silent. Now the tide flushes them from their indolence and breaks their silence. They “pphoot” their way into the distance. Overhead un-see-able ducks fly over (they could be geese but I think the wingbeats are too fast for that) the wings making a zipping sound as they tear at the still cold air. Like all the other sounds they fade away to my left in the direction of the marsh. Just the Blackwits and the Knot are left in the soundscape now. There are about 30,000 Knot on the estuary at present (counted in the daylight!) and most of them must be right in front of me now. They are communicating with soft clucks, a little bit like a hybrid of hen and Jackdaw calls. Suddenly they all take flight and I get quite a shock. The sound of all these birds taking off at once is like 20 tonnes of gravel sliding off the back of a wagon. As the sound of the wings subsides I am left in near silence. Just the soft rushing sound of the waves remains and the gentle gurgle of the water filling the lattice of channels in the mudflats. In the far distance I can see the streetlamps and house lights on the Welsh side of the estuary. I look through my binoculars, redundant until now, at the A55. I can pick out the moving headlamps and tail lights of the traffic. They appear to be moving slowly and I wonder if this is just because of the distance I am from them or if it’s down to the rush hour. Looking at all these people commuting home, and with the birds now gone, I have the urge to get home too. I notice for the first time that my back is starting to ache from sitting on the cold armour stone ( it looks a beautiful pale blue in the moonlight) for too long. I can feel the pull of the armchair and could do with a central heating hug. I start to trudge home, surprisingly I manage to avoid tripping on the rock strewn beach. I can’t help stopping every now and then to take in the night sky. When I was a kid I had a crayon set with colours in many different shades. These shades were all named, most with normal names some with slightly odd ones. One that always confused me was a deep shade of blue called “midnight blue”. This seemed daft to me, the night was black, everyone knew that. Now I see why it was given that name. Looking up the sky is the exact shade of that my much maligned midnight blue crayon, but moreover it seems.... well, luminous. Very hard to explain, a luminous darkness, but it really did seem to be glowing. I pick up the pace as I leave the shore by the Marine Lake, I’m really chilled now. I send a cheeky text message to my wife requesting a hot drink for my arrival home. 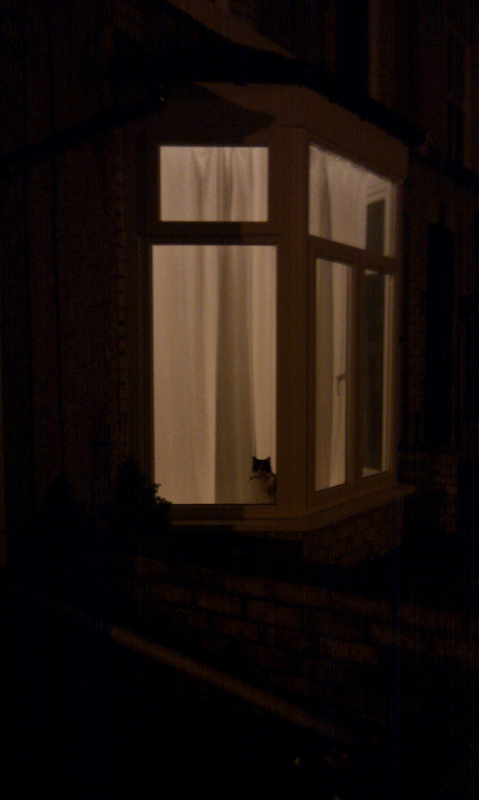 I pass many lit windows and see the occupants enjoying tea and TV. I round the corner into our road and fumble with frigid fingers for my keys. I look up to a see a most welcome sight. Our living room illuminated and the kitten sat looking out. I walk into a toastie warm house, I’m handed a steaming mug of cocoa and a bowl of spicy chilli. In no time at all my bones are warmed again and my belly is full. Happy, I sit down in the arm chair, boot up the laptop and start to type the tale that finishes with this full stop . Another brilliant and evocative post! A great read, I enjoyed that.